1) How can Iran be accused of trying to destabilise a region by supplying arms to Hezbollah and yet when America supports Isreal by suppling arms and supplies it is to: “keep peace and security in the region.” (source). 2) Why is the U.S. on one hand supporting the United Nations draft resolution for a cessation of hostilities, and at the same time supplying GBU-28 “bunker buster” laser-guided bombs to the Israeli military? 3) And what the hell about the sale of ‘wide blast area’ cluster munitions continuing considering the Administrations apparent dislike for the scale of Lebanese civilian casualties? This is what gets me more than anything. 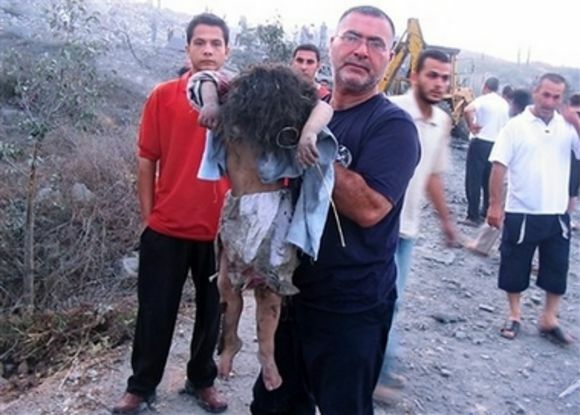 Isreal ‘deeply regrets’ the attacks that result in civilian deaths. “The M26 rocket is launched from the Multiple Launch Rocket System (MLRS) to ranges of 32 to 38 kilometers and it creates a wide-area effect by dispensing 644 M77 submunitions. A typical volley of six rockets would release 3,864 submunitions over an area with a 0.6 mile (1 kilometer) radius. U.S. testing data puts the initial failure rate of M77 submunitions at anywhere between 5 percent and 23 percent. British military testing indicates an initial failure rate of between 5 percent and 10 percent. Both governments note that initial failure rates largely depend on ground conditions, range and other operational factors. Remember those instances in Afghantistan were the aid packages were little yellow packages, and the sub-munitions that come out of the M-26 were little yellow grenades? And how a lot of them didn’t explode immediately? Same brutal anti-civilian weapon. So while America continues to ship munitions off to Isreal “in the interest of peace and broader international security”, how are we making sure that they are being used properly? What kind of safegaurds are we putting in place to ensure that innocent people don’t get maimed, mutilated, decapitated? Is there any chance in light of the current situation that we may stop such a sale? Evidently, due to the carnage taking place right now, I think it’s safe to assume that ‘care’ is not something that the Isreali military are considering as a central doctrine. America is condemning the violence and supporting it in the same breath. Such hypocrisy.